Around 9:30 Mars time, a message arrives from California, where it was sent 15 minutes earlier. "Drive forward 10 meters, turn to an azimuth of 45 degrees, now turn on your autonomous capabilities and drive." Once it arrives, its 17 cameras take shots of its environs. Its laser zaps rocks. Other tools on board drill into a particularly interesting rock to study small samples. Around 5 pm Martian time, it will wait for one of NASA's three satellites orbiting the planet to pass overhead. Curiosity will then send several hundred megabytes of scientific data via large ground antennae to its human masters on Earth. On the ground floor of building 34 at NASA's Goddard Space Flight Center in Greenbelt, Maryland, scientists pore over Curiosity's data every day at 1 pm, in a large windowless room full of scientific instruments and computers. 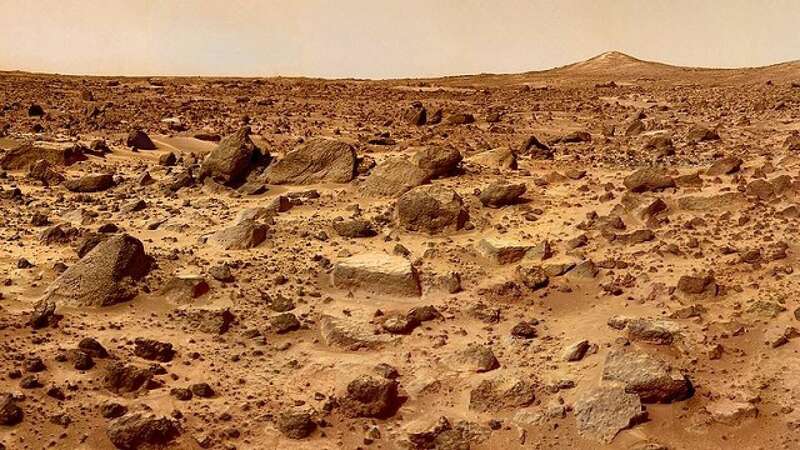 The scientists are looking for any indication of life on Mars. Inside Curiosity lies a "marvel of miniaturization," says Charles Malespin, the deputy principal investigator for Sample Analysis at Mars (SAM), a chemist's lab the size of a microwave oven. "It's the most complicated instrument NASA has ever sent to another planet," said Malespin, who has devoted his professional life to the project since 2006. SAM analyzes samples of Martian soil by heating them in an oven that reaches 1,800 Fahrenheit (1,000 Celsius). The hot rocks release gas, which is separated and analyzed by instruments that offer a sample "fingerprint." When they look similar, she can say, "Ah, that's the right molecule." It is thanks to SAM that researchers know there are complex organic molecules on Mars. And SAM has helped scientists learn that the Martian surface -- geologically speaking -- is far younger than previously thought. "If you're going to go to Mars, you don't want to bring stuff that's already there that you can use for resources," such as water, said Malespin. "If you want to mine the soil and heat it up and release the water, you can bring a big oven with you and you have all the water you want." On the other side of the United States, at NASA's Jet Propulsion Laboratory in Pasadena, California, about two dozen men and women make up the team that drives Curiosity. "My favorite part of the day (is when) I get to sit down and start looking at the imagery from Mars and understand where the rover currently is," said Frank Hartman, who has driven both Curiosity and another, older rover, Opportunity. "And my feeling is that sometimes I'm probably the first person on Earth looking at some of these pictures." The Mars drivers' main job is to write the sequence of commands for the rover to follow the next sol, or "day" on Mars, which lasts 24 hours and nearly 40 minutes. There is no joystick, and no real-time communication with the robotic vehicle. There is a delay whenever drivers realize something has gone wrong, whether it's Opportunity getting buried by a Martian dust storm earlier this year, or one of Curiosity's wheels getting pierced by a sharp rock. Or the breakdown of Curiosity's drilling machine, which happened at the beginning of this year and took a few months to resolve. "We haven't been to any of these places before," said Hartman. "And so we always have to be aware of the fact that we know so little about what we're encountering." Opportunity "retired with honor," said Hartman. Curiosity, which landed in 2012, has so far traveled just over 12 miles (19.75 km). It must wait another year before reaching its goal, Mount Sharp. Then, a few months later, it will lose its Martian monopoly. Two rovers -- one American and one European -- are scheduled to land on the planet in 2020.